Landing pages are used extensively these days because they are the best way to convert site visitors into taking the action you would like – that could be submitting an email address, downloading an app, making a booking, purchasing a product or simply viewing information about your company. They work especially well with paid traffic, so for example, instead of sending people via Google ads or Facebook ads to a page on your site or your homepage, you can create a special landing page designed to encourage the required action. PPC experts have been using them for years – A good landing page should be concise and straight to the point. It should have a direct call-to-action at the end. If you do just that, then you’ll most likely have an effective tool that guide people to take your desired action. In this post we will be looking at WordPress plugins which make it super easy to setup and maintain a landing page, but first let’s take a look in more detail at the benefits of using a Landing Page. What do you visitors often do when they arrive at your website? The natural thing is for them to see what your website does, and how it could be relevant to what they’re searching for. From there, they’ll decide if they want to pursue the purchase or not. What if there was a way to create a single page that could tell your customers what you do, what your product or service does and how it could benefit them? You can also direct the action you’d want them to take at the end- either signing up for a trial, a subscription or buying your product. A landing page can do just that. Moreover, you can create more than one landing page, depending on who or what you’re trying to target. Changing one page in your website will prove to be a million times easier than having to change all the relevant pages in your website when it comes to increasing conversions. Any changes will surely affect the way your visitors see and experience it. Gain the ability to make lightning-quick changes and carry out testing without having to change your main website. You’ll have complete access without it being a burden to your site’s conversion rate and overall performance. Landing pages are a constant work in progress. You can’t expect to be perfect at first- there’s to be some testing involved to see whether landing page version A converts better than landing page version B. Most landing page tools have built-in split testing support. The best ones have a comprehensive range of A/B testing features; some of these tools will even automatically pick out the best version for you! Moreover, you get included analytics tools that provide important stats and let you see whether you’re successfully converting or not. Need more reasons to get your own landing page? Here’s more. Landing pages provide a direct means to achieve your business goals. For example, you might be running a marketing campaign and offering something valuable for your visitors in the end. You wouldn’t want to have your visitor running around your website trying to figure out what they need to do to get what they came for, right? You’ll want to help them walk a straight line, which helps both the visitor and your business at the same time. Landing pages were created to provide an excellent user experience. Everything that an interested buyer needs is in there. Before, you’d need the use of plugins to craft working landing pages. Thanks to the advancement of plugins and the proliferation of WordPress, web masters wouldn’t have to slog through several plugins to put in the necessary elements. We can point you to the Best Landing Page WordPress Plugins if you need help sifting through all those available plugins in WordPress today. The power to convert visitors into paying customers- that’s what these WordPress landing page plugins can do. The best part is that you won’t have to be an expert web designer or a programmer to get started. We’ve listed the best and the most popular choices when looking for the best landing page plugin, some of these plugins are classed as Page Builders which will let you create all types of page layouts and even complete websites and some have been created specifically for creating landing pages for PPC and other forms of paid traffic. 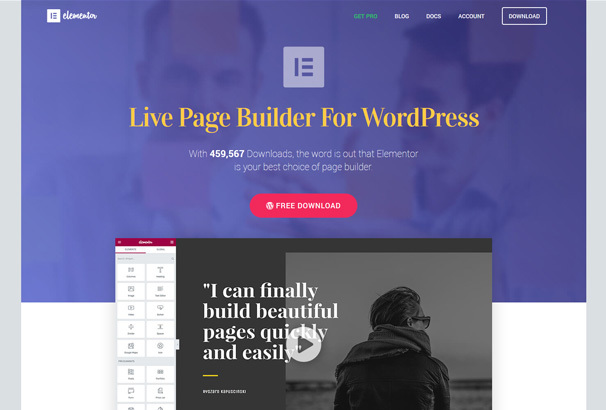 Elementor is a Drag and Drop Page building plugin, You will be able to design and build live pages and posts that won’t slow down your overall website’s performance. The intuitive interface is such a joy to use – you can edit and see the results in real time. Pages can be crafted with a designer’s touch, including aesthetically-pleasing tools such as entrance and hover animations, background overlays, box shadows, advanced buttons, etc. You can create high-end designs from thin air with virtually no line of programming code done. Once you’re done, Elementor churns out a page that is also optimized for viewing on smaller screens. This plugin is great because there are a few outstanding features found within. The exclusive toolset can work its magic in the right capable hands to deliver an attractive, lightning-fast landing page. Perhaps what’s most impressive of all is its open-source and totally free so you can take it for a test-drive before deciding if you need to upgrade to pro features or not. 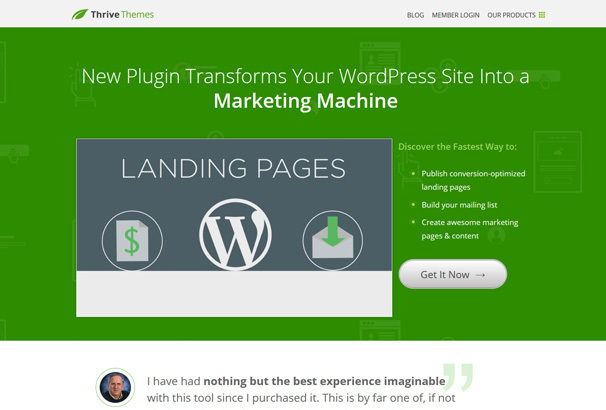 Want to get the fastest landing page plugin for the WordPress platform? Look no further than Thrive. It’s a powerful landing page WordPress plugin that won’t require a line of programming code to create an effective landing page. 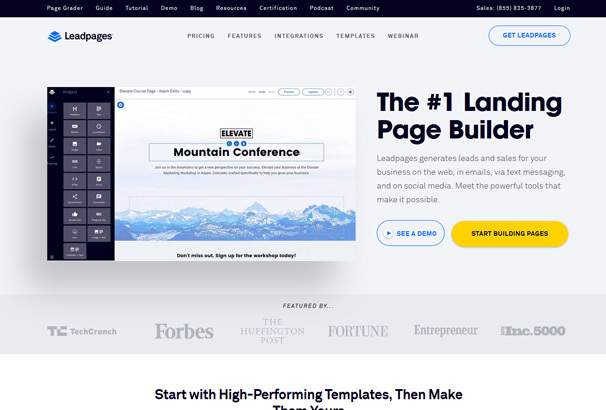 If you’re trying to build landing page sets that work well together, then this specialized plugin should be on top of the list. This goes the same for long-form sales pages. Thrive lets you choose from over 30 given templates at a time. All of them have the familiar drag and drop variety that makes everything so much easier and faster to make. You’ll be able to edit important elements such as the testimonials, the countdown timer and grid, the call to action button, the columns and the content boxes here. All of it is made with utmost speed and responsiveness in mind. Thrive also has the split testing feature and some advanced analytics tools you can use without getting out of the Thrive window. Annoyed by the 404 error pages? Thrive can work that to your advantage by placing a simple opt-in page, asking visitors to put in their information so they can get what they’re looking for. You can even create landing pages for your Facebook account should you need it. You can get the Thrive Landing Page and the Thrive Content Builder to craft unique landing pages in an intuitive drag and drop, front-end based environment. Created by the Designmodo team, Qards is a WordPress plugin that has two distinct features. One, it works with almost all WordPress themes, and two, designing a landing page becomes an easier affair, thanks to its card-based content structure that lends to the plugin name. When you open up Qards, you’ll be asked to choose from a set of content cards you can apply to a blank canvas. Simply place one card after another, and pretty soon you’ll gave a complete landing page built right before your very eyes. Each “card” can be edited for a better landing page fit via a front-end editor that displays the results in a real-time window. Qards is a no-frills landing page solution that has virtually no learning curve. It works with your current theme and integrates well with your existing website. All of the content will be left intact. If you need to create 100% unique landing pages, then simply arrange the cards as you see fit and according to your goals and needs. You won’t need to worry if it’ll show well on mobile screens- Qards has a built-in optimizer that will do all the work for you. Moreover, the content boxes are all customizable and the default designs all look sleek and modern. Qards is for the campaign manager who wants to have a great landing page without the dirty work required to build them. Simply install and start building your dream landing page in minutes. 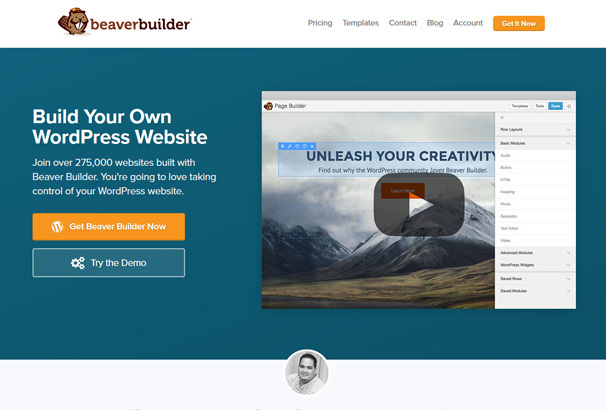 Beaver Builder is a 2-in-1 plugin and theme combo. You can download the plugin as a standalone if you’re just looking for a WordPress landing page builder. It comes with a wealth of features that give you everything you need to create a powerful landing page. Like all other excellent plugins, Beaver Builder has a complete drag and drop environment working in on your site’s front end. Real-time feedback allows you to see the landing page even before you apply the changes. Start creating by using the built-in landing page templates. You’ll have the ability to export or import the elements you can retained. Choose staple design elements such as headings, text, videos, photos. You can customize your landing pages if you also use the Beaver Builder theme; otherwise, you’re limited to the current theme you have on your website. Your landing page creation will be fully compatible when viewed on mobile screens. If you’re looking for a plugin that will work well with all your other plugins on all of your sites, then Beaver Builder is a great choice. 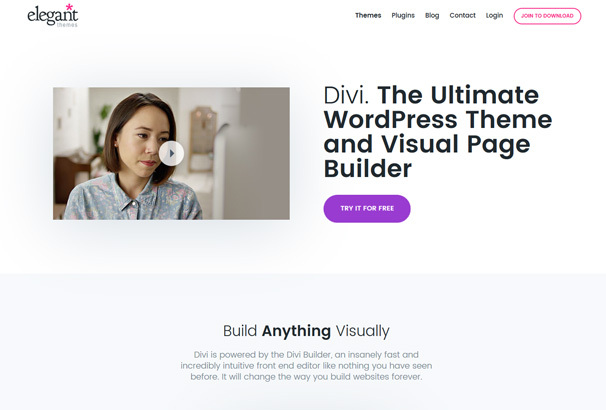 Divi is touted as the most advanced builder in the plugin market today, and it delivers on its promise. 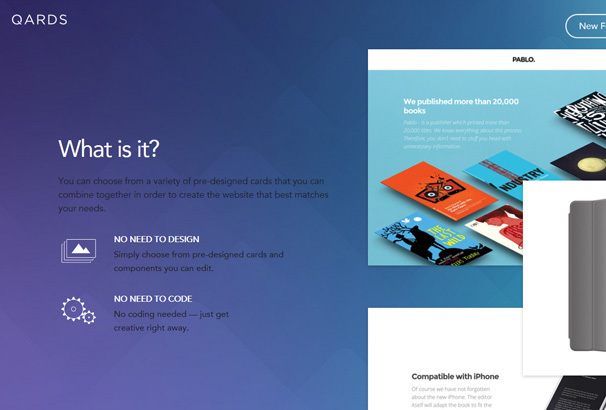 The Divi Builder allows for some really interesting custom landing pages. Once you become familiar with what each button can do, then it’s simply a matter of imagination. There’s no landing page you can’t create! The plugin is fully compatible with all themes. You can seamlessly create your landing page and blend it in to your existing blog. Building with Divi is a lot like playing with building blocks. The included modules allow you to add the following elements- a call to action button, a contact form, an opt-in form, price tables, testimonials and other essential components. Everything can be dragged and dropped from one place to another, and arranged according to your preference. The resulting landing page will look great on any mobile screen. The content is optimized for fluidity and responsiveness. The awesome thing about Divi is that your landing page’s design quality won’t break no matter where the user is accessing it from. Everything works and there’s virtually no hiccup. Lead Pages is one excellent WordPress plugin that we could never get enough of. Lots of WordPress web owners feel the same way! Let’s start with the fact that it allows one to create a functional landing page in the fastest possible time. In minutes, you will have an attractive and effective landing page that’s set to convert audiences into paying customers. You can make it as simple or as complicated as you’d like, depending on your goal. Bring in customers or new subscribers to your program. Make your visitors download free content in exchange for their email address. The possibilities are endless. You’ll be surprised at the amount of customizations and pre-made templates when you get into Lead Pages. Pick one and enter your information to acquire it for using on your landing page. One of the most notable things about Lead Pages is the way it calls up landing pages quickly- all users need to do is to choose the best template, click on the buttons provided to customize the landing page, and hit the “publish” button. It’s simple, easy and intuitive. Moreover, you get to choose what to do with the finished landing page. You can put it directly to your WordPress site using Leadpages plugin or download the HTML page to use on any other web platform. Gain the ability to create unlimited landing pages for use on all your websites. You can also host via Leadpages and view them all on a single dashboard. This way, you’ll have an excellent bird’s eye view on all of your landing pages. SeedProd is definitely one of the best plugins to use if you’re thinking about building a list right before launching your site. It’s also a great ally to have whenever you’re site undergoes downtime and maintenance. With SeedProd, you get a countdown timer and full-screen backgrounds with ready-made, customized templates. 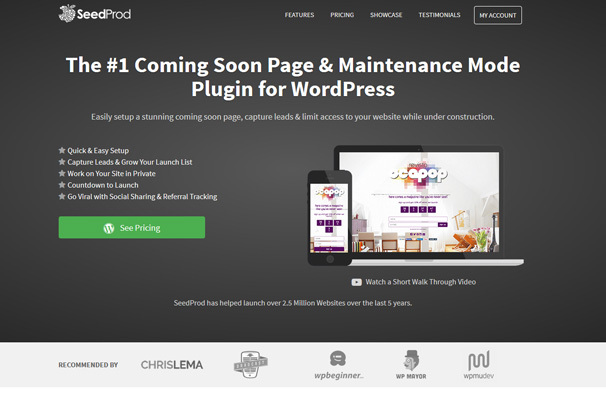 At its core, SeedProd is a “work in progress”, or a “coming soon” plugin that creates a landing page for any of your upcoming website. This also applies when you’re wanting to create a landing page for your downed website. One of the main objectives before product launches is collecting as many email addresses as possible. SeedProd allows web masters to accumulate email addresses even while the site isn’t completely done or while under maintenance mode. But SeedProd isn’t all just that. It integrates well with some of the best email marketing platforms in the market today. You will be able to put in your social media buttons on the landing pages you’re creating, which helps you grow your group of followers. Building a sizeable buzz before product launch is made easy with SeedProd. Even if you’re in the midst of creating a landing page, you should have the SeedProd plugin handy. It’s a useful tool that can be prove to be invaluable as time goes by. WordPress Landing Pages is specifically made for collecting email addresses and for growing your email list. The visual editor allows you to see all that you’ve made in a real-time environment. Your campaign can be further optimized via the detailed statistics page and the A/B split testing that’s instrumental to the success of a landing page. Test several landing page versions to see which one works best for your cause. Choose from over 40 available templates divided into their respective industries. The pre-made templates are compatible on mobile screens and SEO optimized for the best results. Of course, you can also forego the pre-created route and start from scratch to realize your very own landing page. You’ll also find that there are plenty of both paid and free add-ons for the WPLP, including WordPress leads and Calls to Action. 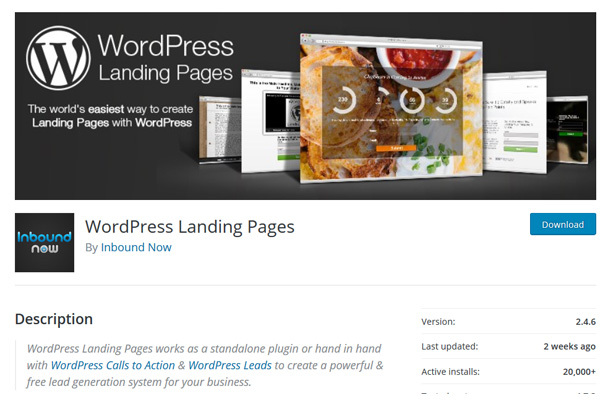 WP Landing Pages is an excellent free plugin for WordPress. You can set up autoresponders or set this plugin in combination with your email marketing platform, provided you purchase the premium add-ons. Even without the add-ons, this plugin does a good job in gathering valuable email. 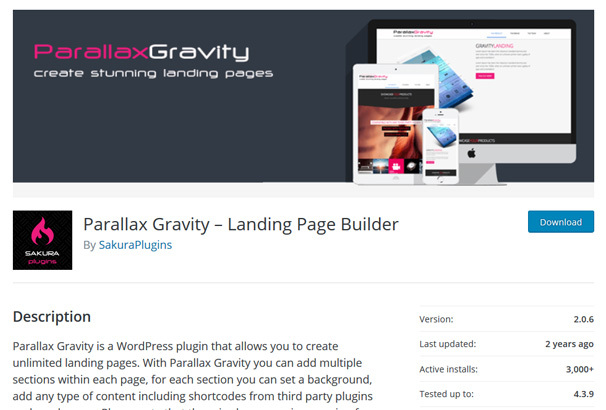 Parallax Gravity sounds more like a science fiction phenomenon than a WordPress plugin, but make no mistake about it- Paralax Gravity has the ability to provide unlimited landing pages for you. It makes good-looking landing pages that are 100% optimized for tablet and mobile screens. All the content pages made using Parallax Gravity are automatically optimized for SEO as well- you can put in custom keywords where needed. Landing pages are often created to serve one marketing campaign. Once done, it stays on the website until removed. There are instances where visitors are still making their way to the landing page even when the offer has expired. Parallax Gravity can make it so that the visitor won’t have a wasted trip- they’ll be redirected to a custom URL where they can see other products or offers. This plugin works with Google analytics so you’ll see how your campaign is performing. The implementation of QR codes make it easier for you to see the responses in a specific landing page. There’s no landing page you can’t create if you use the best landing page WordPress plugins mentioned above. The possibilities are endless, limited only by your imagination and your end goal. All of them have the necessary functionalities to make it an easy affair- drag and drop environments, responsiveness, unique templates and intuitive features. You can install all of them and see which one works best for you and your website. We hope that this landing page roundup serves as a great informational content that translates into a massive success for you and the creation of your highly converting landing page!